Showing results for tags 'Bronco 2'. 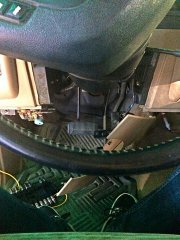 http://m.ebay.com/itm/52-LED-LIGHT-BAR-4X4-OFF-ROAD-JEEP-GMC-BRONCO-CHEVY-TOYOTA-FORD-FOG-LIGHT-/380942795438?nav=SEARCH Good idea? 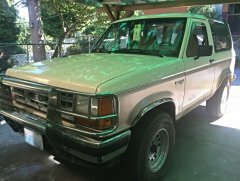 Anyone have experience buying light bars for a bronco 2? Any suggestions? Gutter clamps? Definitely trying to stay on the lower end for cost. Just trying to find something that is worth it! Does anyone have experience with keyless entry? I'm thinking about getting it installed in my b2 and was wondering if it's worth it and what brands would be recommended based on opinion! I do have power locks, not sure if that info is needed! My reasoning for wanting it is Digging out the door key vs the ignition key in a mall parking lot at night just isn't a good time. Lol. So please anyone with experience, give me your opinions/recommendations! Thinking about painting the wiper arms pink. anyone else painted wiper arms? Opinions? Advice? 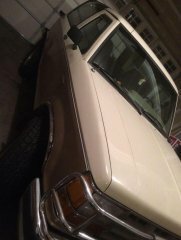 I want my truck to be different. I've got some pink camo on the inside. It gets mistaken for "daddys rig." Pink kinda goes against the "daddys rig" thing. 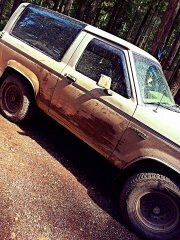 Went and played in the mud! 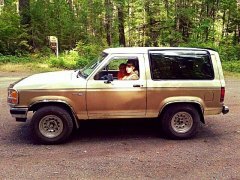 Hey guys, I have an '84 Bronco II 4 spd and I started having issues with it a few days ago. When traveling from a stop the car feels like it has gone into gear but then it doesn't move, it feels just like it would if I had left the parking brake on (I did not). After going from reverse to first a few times it started going (very slowly at first) then once I am moving the issue goes away. Any ideas? Leaky rear side window, temporary fix? dad thinks we should caulk it. how hard is it to remove the window itself and replace weatherstripping or whatever is used? any help is greatly appreciated! Got it locked up in the garage until I fix the leak in the rear driver side window. Took it out hunting for grouse on opening day. Me and my niece in the truck and my brother took the photo! Every time I hit about 25 mph I get a clicking/rattling sound in the front right tire. It stops when I turn or hit the brakes. Could it be the hub? Anyone else had this problem?